Bookmakers, compulsive gamblers, prostitutes and incredibly rich Indians were last year part of PhD Stine Simonsen Puri’s daily entourage. For half a year, the researcher from the University of Copenhagen spent most of her waking hours at the New Delhi racecourse, where she did field work for her PhD dissertation. The dissertation provides insights into the major illicit Indian economy, which many Indians rely more on than the legal one – but which we do not hear much about in the West. 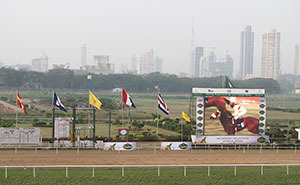 - I have studied the legal and illegal financial transactions that take place every day at the racecourse in New Delhi. Approximately 4,000 people visit the races daily, and they bet everything between 25 cent and 20.000 $ in a race. But often, the really large bets are placed outside the established system to avoid taxation, providing the foundation for a large, illegal economy, Stine Simonsen Puri explains. In her thesis "Speculation in Fixed Futures. An Ethnography of Betting in between Legal and Illegal Economies at the Delhi Racecourse", which she recently defended at the Department of Cross-Cultural and Regional Studies at the University of Copenhagen, she studies, among other things, the handling of money and morality in a society like the Indian that is characterized by both tradition and modernity. - In my thesis, I focus on the information networks and alliances that arise in a society with very little trust in the "system" – as well as on the illegal, financial transactions that grow out of this distrust. In India, the legal and the illegal economies work parallel to each other, and in many cases you choose the illegal economy over the legal one, because it is at times considered more reliable. Everything that we normally associate with the legal economy, such as credibility and transparency, is connected to the illegal economy in India – and vice versa. One of Stine Simonsen Puris conclusions is that you bet as much on the people surrounding and tending the horses as on the horses themselves. - This resembles the attitude the Indians generally have towards politics and the Indian political-economic system. They suspect that any political decision is based on power and on someone trying to feather his or her own nest or someone they know. In my thesis, with the racecourse as case, I investigate the Indian idea of the future being predetermined, scripted and theatre-like. The thesis provides insight into a relatively unknown part of the Indian economy, but it also tells us about a marginal area that we don’t necessarily hear about in the news. - The stories from the margin are often extremely interesting because they focus on things that are not otherwise present in the media. But they add an important piece to the overall story of India. The thesis also shows that financial speculation exists beyond Wall Street. It is interesting to encounter illegal speculative markets and to look at the many ways in which they can exist, Stine Simonsen Puri says. The thesis is primarily based on Stine Simonsen Puri’s fieldwork including her own experiences and interviews with gamblers at the racecourse in New Delhi, but also incorporates historical and statistical data. The researcher describes the track in Delhi as a small 'island' – the dream of any anthropologist, because you can work methodically within a demarcated area. As part of her research, Stine Simonsen Puri also gambled. - It was 100 percent necessary for my field work, if I wanted to get close to the gamblers and bookies. Conversations at the races often start with a question like 'What did you play' and if I could answer 'Number 4' instead of 'I do not play', I was already well ahead. Part of what I studied was the gamblers' relationship with their bookies, and this required that I myself established such a relationship through betting, she explains. The thesis provides insights into the gambling environment in India, where horse racing, due to a more than 150 year old British law, is among the only forms of gambling allowed. Cricket betting is also immensely popular in India, but this is primarily conducted by phone because it is illegal. - But cricket betting too is huge – much bigger than horse betting. An enormous amount of money is played illegally on cricket games. There is an international interest in entering the cricket betting market in India, so eventually legislation may be changed as it represents a considerate source of income for the Indian state as well, Stine Simonsen Puri says.